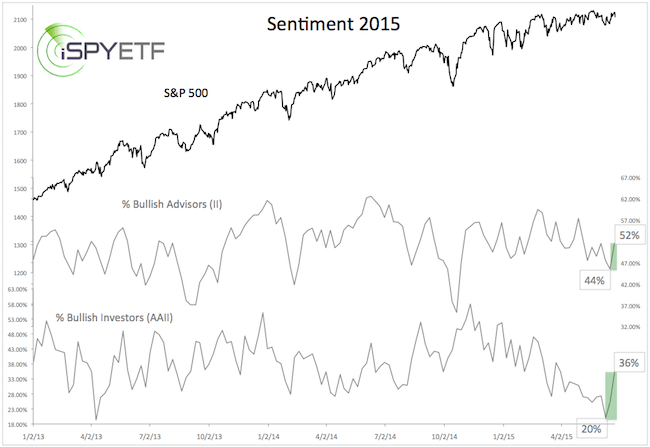 A couple of sentiment indicators (such as AAII poll) showed extreme pessimism recently. 2011 saw an 18% drop starting in July. The question for right now is this: Is there too much pessimism for a summer correction? The first chart shows sentiment in 2011. The gray bar highlights June 2011. 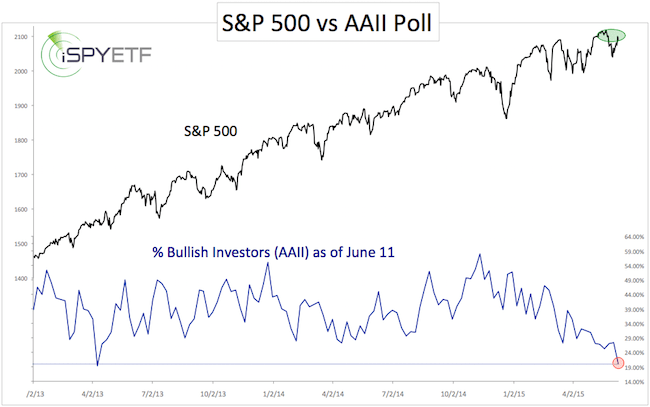 By mid-June, investors polled by the American Association for Individual Investors (AAII) and Investors Intelligence (II) had become quite pessimistic. 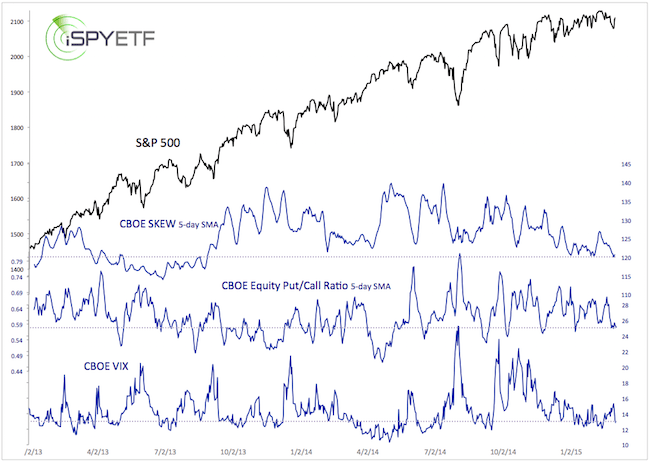 Only 24% and 37% of investors were bullish. A 7.8% S&P 500 (NYSEArca: SPY) rally from June 16 – July 7 relieved much of that pessimism, but it didn’t take a spike into extreme optimism for stocks to plunge in July. A look at current sentiment shows a similar scenario. Optimism was quite low (extremely low for the AAII survey), but recovered, no doubt due to the 58-point rally from the June 15 low. The week after June triple witching (June 19) is quite weak. How weak? 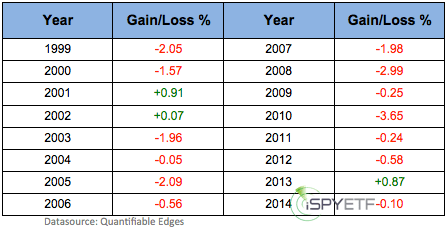 The S&P 500 (NYSEArca: SPY) has been down 13 out of the last 16 years (81.25%). Investing rarely offers such strong statistical edges. This morning’s 20-point jump and open gap at 2,000 likely increases this statistical seasonal edge. Of course, any edge always needs to be viewed in context of the bigger picture. Has the Market Fooled Enough Bears to Tank? 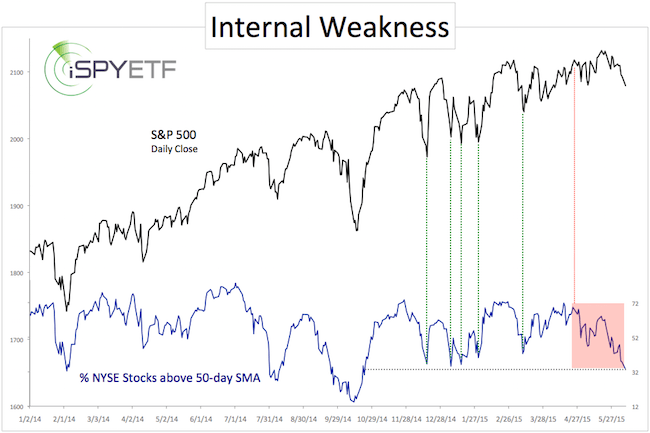 By some measures, investor sentiment turned extremely bearish last week. 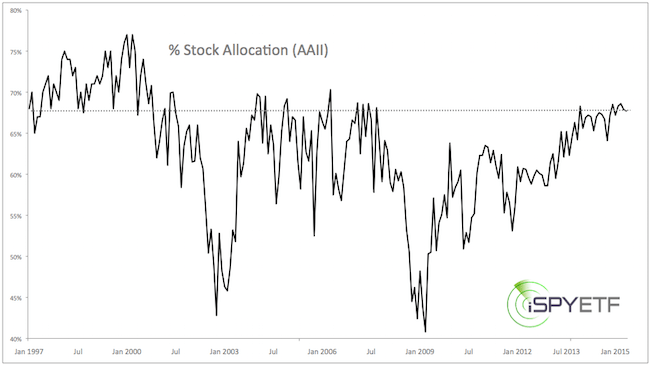 Only 20% of retail investors surveyed by the American Association for Individual Investors (AAII) were bullish on stocks, the lowest level since April 2013. “Prechter has predicted a sharp collapse literally every single month since late 2009, and it’s unlikely to occur when you see it featured on the Yahoo!Finance homepage. 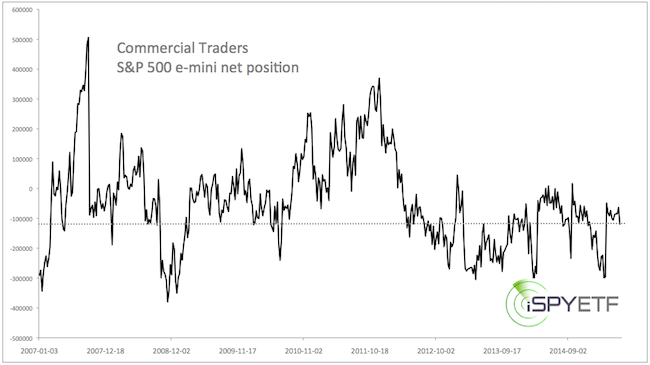 We’ve been watching the rally thin and become narrower since April, but when the media starts to pick up on such nuances, the information usually isn’t worth too much anymore (an interesting bullish twist of this thinning market was discussed in this June 9 article). Perhaps somewhat anecdotally, but nevertheless telling, my article titled “Will the market rally to flush out a horde of premature bears?” (published on July 12 on MarketWatch) got very little attention. It just wasn’t bearish enough to attract attention. Two of my other articles (with neutral or somewhat bullish titles) on the other hand quickly made it into the top 5 most popular article list at MarketWatch. I’m no genius, but I’m learning that the market is highly unlikely to crash when everyone expects it. A watched pot doesn’t boil. After all, this is not the first time we’ve been there. I.e. 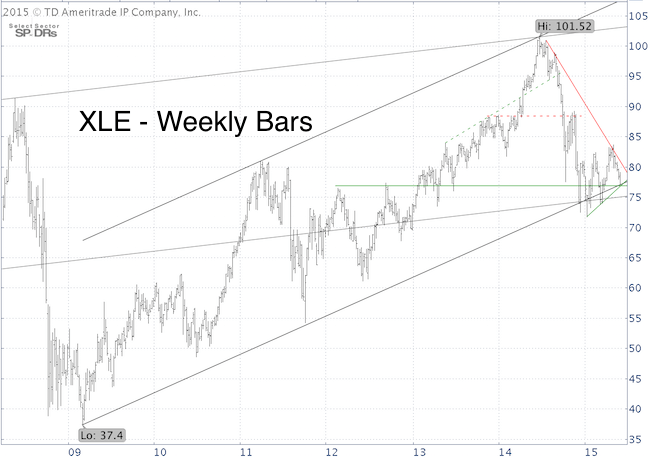 Sep 18, 2013: Who or what can kill this QE bull Market? 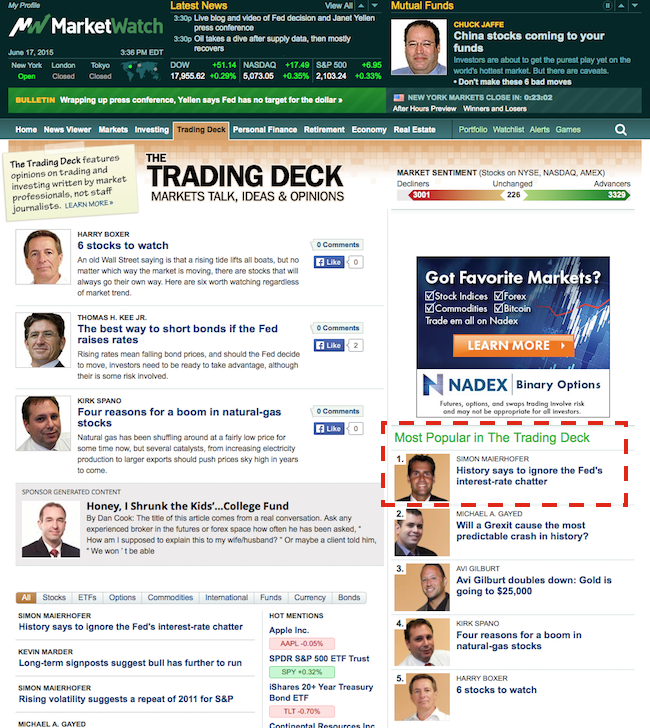 or July 25, 2014: Bears cry wolf – Everyone wants to be the next Roubini. The 4-day, 50-point S&P 500 rally has no doubt caused an uncomfortable squeeze for committed bears. I would like to see additional gains, which would likely set up a nice opportunity to short the S&P 500 into July/August. This opportunity will likely come at a time when fewer people expect it. 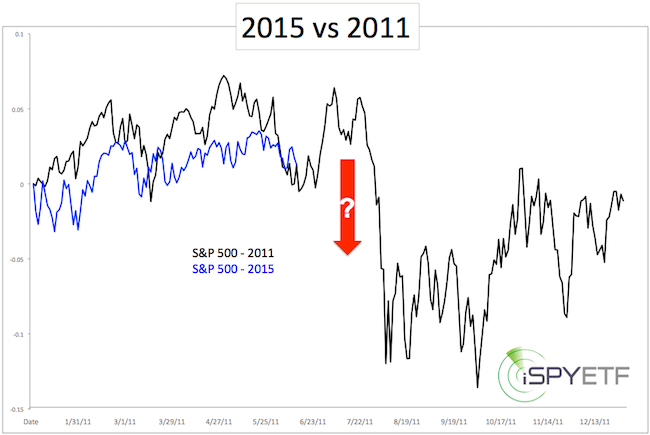 A recent article highlighted the similarities between 2011 and 2015 (2011 saw a 20% summer meltdown). 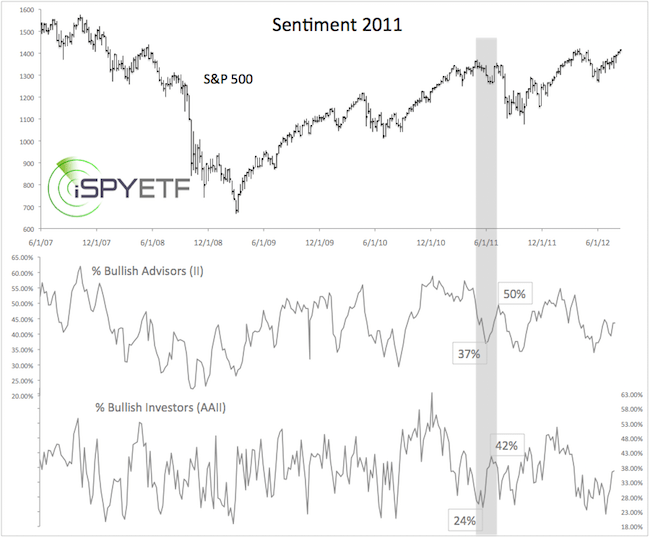 Sunday’s Profit Radar Report featured a revealing investor sentiment comparison between June 2011 and June 2015. You may access this comparison instantly here. It may also be the topic of an article for next week. Bad breath stinks (literally), so does bad breadth. The stock market’s had bad breadth since late April, and gains are wilting. 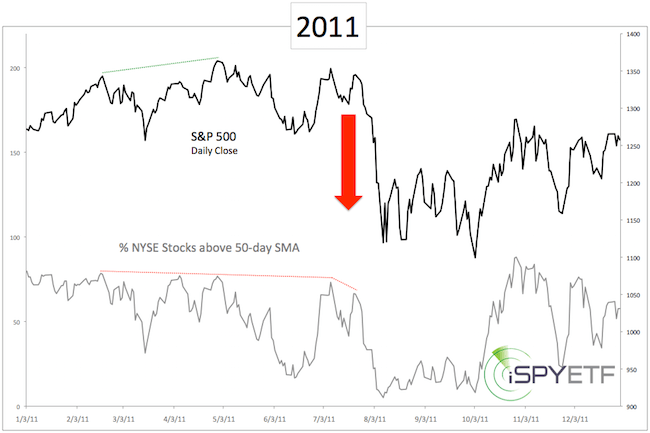 One breadth measure I’ve been watching is the percentage of (NYSE) stocks above their 50-day SMA. The chart below shows when and how the market started to tire (red line). Corrections don’t always happen immediately, but 6 of the last 8 corrections (since 2014) were preceded by such a divergence. 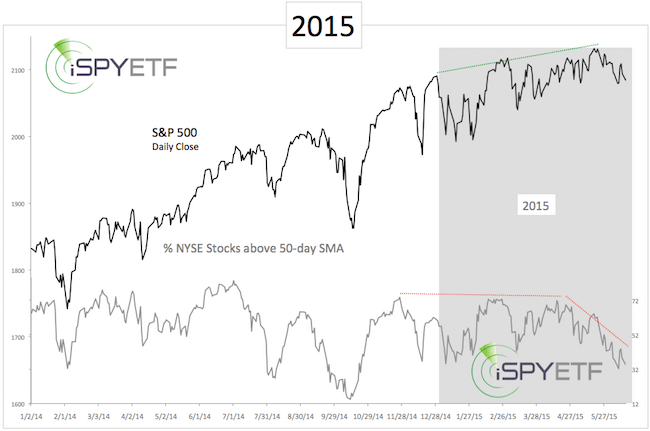 The % of stocks below their 50-day SMA has dropped to the lowest level of 2015, which makes for an interesting twist. As the green lines show, when too many stocks drop below their 50-day SMA, the S&P 500 rallied every single time in 2015. This cautions against turning too bearish. 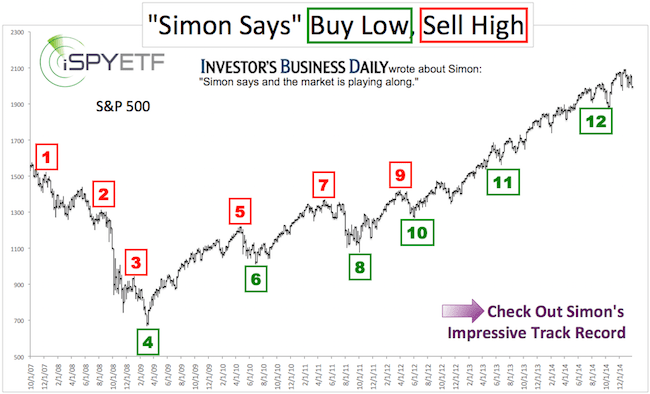 How stocks react around current levels may give an indication if we’re still in the ‘one step up, one step down’ market, or if a deeper correction will develop.